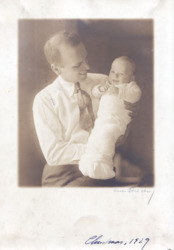 Binkley with Robert Jr., Northampton, Christmas 1929. The article “Ten Years of Peace Conference History”, which he finished in Rome and published in the new Journal of Modern History (part 4), established his reputation as the leading Peace Conference historian of the younger generation. This vindicated Smith College’s decision to hire him to replace Fay, and made him a “marked man” at the AHA conference in Durham in December. As a result he was “called” to Western Reserve University the following spring, as he had been called from NYU to Smith College. His rising prominence led to book contracts for Realism and Nationalism in William Langer’s “Rise of Modern Europe” series with Harper, and for a biography of Napoleon III in Carlton Hayes’ series of biographies with Norton. The campaign to open up the various private collections of Peace Conference documents (part 7) began to bear fruit in the form of Parker Moon’s agreement to allow his personal collection of Central Territorial Commission minutes to be copied for the Hoover War Library,2 though it was also impeded by David Hunter Miller’s absolute refusal to allow his Diary to be published more widely.3 The difficulties created a space for maneuver and innovation, which led to Binkley’s involvement with James Shotwell’s series of publications of Peace Conference materials for the Carnegie Institution and his first experiments with microfilm. The talk on perishable paper at the Congress and the intricacies of his plans for Peace Conference materials led ultimately to his appointment to the Joint Committee on Materials for Research (part 8), which was the main forum for the development of his ideas on scholarly communication for the next ten years, until his death. The themes which would define his career had now emerged and were starting to intertwine. The bibliographic conference itself brought out the themes of preservation of paper and microcopying as problems that must be solved to prevent the loss of documentary historical evidence. The Peace Conference had begun to move from the domain of journalists to historians, and the history of the Peace Conference and the peace was challenging the historiography of the causes of the war. Binkley’s review article marked him as a leading young historian of the peace. His approach to Peace Conference history via its internal documents represented his commitment to documentary history and led to his participation in James Shotwell’s series The Paris Peace Conference, History and Documents, for The Carnegie Endowment for International Peace. The review article for peace conference materials represented Binkley’s thinking about the need for bibliographic description to make scholars aware of the resources that are available. His work for the new Social Science Abstracts service and participation in the relevant session at the congress (part 2) showed his interest in cooperative solutions to this need. Binkley’s plan to force open the closed collections of peace conference documents through exchanging copies, though not yet closely tied to microcopying (the existing projects were based on photostat copies), lent momentum both to peace conference historiography and to the development of technology for documentary reproduction (part 7). By 1932 he and Frances would be pursing their first experiments in microfilm with Carnegie Endowment funding in the newly-opened House Papers at Yale. By 1936 he settled on the term “mobilizing of resources” for the pairing of microcopying on demand and union catalogues of published and manuscript materials. The contract for Realism and Nationalism sparked the development of his ideas on federative polity: the reevaluation of the narratives of the inevitable consolidation of nation states in the 19th century, replacing federal unions of various kinds. This shaped his response to fascism, which he saw primarily as overreaching nationalism, and influenced his interest in local history as a counterbalance to national history. His ongoing support for Frances’ attempts to carve a space for her intellectual life out of the conventional commitments of wife and mother was part of a line of thought about the purpose of liberal education and its place in a materialistic culture, around which the two of them planned to write a book they called Style of Life. The fact that this line of thinking was rooted in an educated woman’s experience made it all the more relevant to Binkley’s teaching, which would be in women’s colleges for most the the rest of his career (the exceptions being the two guest years at Harvard and Columbia). The desire to equip his students with the tools of historical thinking led to his support for amateur scholarship, and (when circumstances enabled them) to the large-scale WPA projects. Binkley’s aspirations for cultural democracy, as developed in New Tools and History for a Democracy, is still absent. It would emerge as his historiographical thinking started to engage with the world outside the academy. At this point it’s only his avocations that have been aimed at a non-academic audience (What is Right with Marriage, Responsible Drinking). His historical thinking is still enclosed within the historical profession. The social pressures of the Depression and of the rise of Fascism would pull his historical thinking into the public sphere after 1933. With all of these new areas of activity opening up, it was good that at least one project was set aside. This was the book on the European reaction to Woodrow Wilson’s statecraft leading up to the Peace Conference (based on his dissertation), which was one of the ostensible reasons for the Italian trip in the first place. He now realized that he was blocked by Ray Stannard Baker’s slow progress on his multi-volume authorized biography of Wilson. Binkley wrote to his father: “About the Wilson book, no writing can be done until after Baker publishes, for he has the material – the manuscripts and documents – right over here at Amherst.”4 Binkley had corresponded with Baker in May and asked about the papers, which had been entrusted to Baker by Wilson’s widow. Baker made it clear that there was much unpublished Peace Conference material, and that the Wilson papers would probably go to the Library of Congress when he was finished.5 The first two volumes of Baker’s Woodrow Wilson: Life and Letters appeared in 1927, and the eighth and last in 1939 – without reaching the Peace Conference period. As a result Binkley never returned to the Wilson book. Even with that project off the agenda, he was still badly overcommitted. The biography of Napoleon III would never proceed beyond the initial sketch. External events that would shape the rest of Binkley’s career were in motion, too, in ways that he did not notice at all at the time. The stock-market crashed in late October, a week before Frances and the baby left Rome. Neither Bob nor Frances mentioned it in their letters, having no investments. Without the Depression that followed there would have been no New Deal, and the large projects that Binkley initiated in the mid-30s with WPA funding would, if they had existed at all, have been much smaller affairs funded by grants from endowments like the Carnegie Institution and the Rockefeller Foundation, rather than noteworthy projects commanding public interest and employing hundreds of workers. Frances still put her career hopes in her writing, with Bob’s enthusiastic support. A new baby and the pressures of academic convention, though, constrained her increasingly to take up the traditional domestic role of the academic wife. She and Bob generalized her situation to start planning another joint book they intended call Style of Life, setting the value of intellectual engagement against the material rewards of middle-class life. Although the book never materialized, the thinking went into Binkley’s teaching methods for the women of Flora Stone Mather College and his writings on amateur scholarship. Soon the Depression forced Frances’ father into retirement and brought her parents east from Oregon to live with her and Bob in Cleveland. The childcare they provided freed Frances to participate in Bob’s Joint Committee projects. Her work on microfilm led her to start a promising career in photography, only to have it cut short by Bob’s death in 1940 and the need to support her extended family on her own. Binkley began 1929 as an instructor at NYU with a few respectable articles published, agitating for a few promising projects in the fora of academic and grant-agency power. He ended the year in an academic position more prestigious than he could have hoped, and with those projects taking shape and gathering support in a way that would sustain his career and expand his thinking over the decade of the 1930s.